Life in the Roaring Twenties was very colourful and so in keeping with the fashion, Steiff made colourful teddy bears, including a tricolour Harlekin made in bright red and cool blue mohair, with yellow soles and paws. Following this, no further bears were produced like this for a long time and so now Steiff have brought this bear back in miniature form, which is a great quirky little bear. 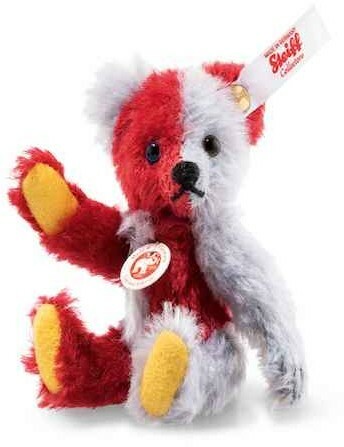 He has the famous gold plated "Button in Ear" and a white label with red writing, showing that he is only limited to 1500 pieces worldwide, making a very collectable bear.